I experimented yesterday..(yeah .. I love my experiments ) with using a analog controller in my left hand (movement+jump+slow walk+ crouch) and the mouse in the right hand (aim+shot+reload+zoom+weapon switch) the results are very surprising. My aim improve allot...+- the lazy factor and beer .. the thing is, that is not a new idea.. It's an interesting idea but it stems a couple questions/problems. First of all, By going from a keyboard to a left hand analog is that you lose pretty hefty number of buttons. This isn't such a big deal on games like CoD/TF2 where you only really need Move, Jump, Crouch, weapon change and maybe a few feature buttons that each game requires but if you start going on the heftier games which have a BUCKET load of buttons (The best example I can think of atm is Arma2 where you have 3 different stances, leans, load of navigation aid buttons (Map, compass ect) to name a few things that you need on hand in that game)that you're going to find it basically impossible to find a way to have a joypad/mouse combo that could support all those buttons. It sounds interesting but reading as to how you are doing the aiming and shooting with a mouse I am wondering how it really is different from the standard keyboard, it isn't a real change if you press either WSAD or Up, Down, Left and right if you ask me (anything else is down to preference if you ask me). As Mittens points out, you might actually lose functionality (AKA less buttons in range) when using a controller over the keyboard but it does depend on the game. MittinsKittens wrote: It's an interesting idea but it stems a couple questions/problems. When I first switched from XBox 360 TF2 to the PC version, I tried using my PS3 pad (the left stick and left triggers) held in my left hand. It worked fine but looked ridiculous. Then I came across the best compromise - the Logitech G13. Since then every PC game I've played has used that and I couldn't be happier! Some people have modded theirs to replace the default hat switch with an XBox 360 thumb stick but I find the default good enough. I've always found razer kit to be a little on the pricey side, but AWESOME. 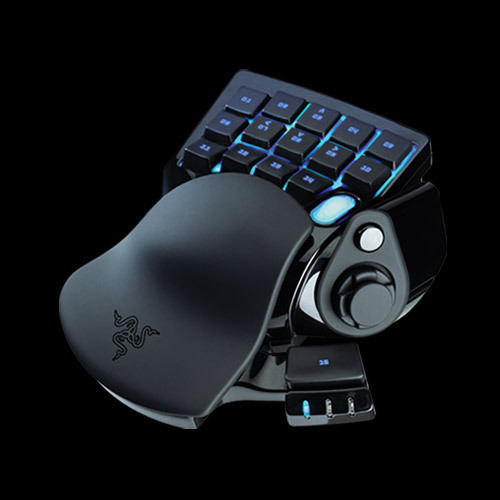 I am using a razer orochi now (smaller than the mouse on my desktop so I use it 'on the go' and at work). I looked into that one but the thumb thing is a D-pad rather than the G13's analog stick.